Kill the monsters and take their stuff! Hit the other players with Curses and interfere with their battles... unless, of course, they offer to share the loot. Munchkin is fantasy gaming at its purest and silliest. Reach Level 10, and win! 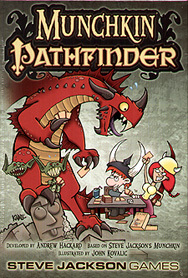 The Pathfinder Roleplaying Game is full of ancient relics, dusty tombs, scheming gods, and enough treasure to choke the proverbial horse. It also has goblins. Mobs of Goblins.